I don’t really feel I need to hide it any more – I love the novels of Graham Greene. This one, Stamboul Train, is an early one, written before all of the major ones and (according to the author bio) was his break-through hit. Greene separated his writing into “novels” or “entertainments”, and classed this as one of the latter. What that essentially means it that rather than making a reader cry at human pain, fragility and dedication (The Power and the Glory, The End of the Affair), it instead made me grin constantly at the pounding excitement created by a heady cocktail of wit, adventure, mystery, intrigue and ribald, pre-sexual enlightenment enlightened sexuality. Like in Our Man in Havana and Travels with My Aunt. Stamboul Train is set on and around the Orient Express, going from the Belgian port town of Ostend through to Istanbul. A mixed group of characters are introduced at the opening and, as some passengers disembark and others arrive on the train, hilarious and exciting adventures ensue. The central figures include: a Jewish currant magnate on the way to buy a rival business; a Northern chorus girl leaving the country for the first time to fill in for an injured dancer; an awful lower middle-class couple on a package tour; a canny, lesbian investigative journalist who gets on the train chasing a Serbian Communist leader she sees climb aboard; the journalist’s very attractive and much younger lover; a Viennese career criminal on the run; and a highly successful novelist from a working class background. It is, of course, a typically Greeneian selection of characters, all of whom jar and interrupt each other at varying significant moments. The Viennese criminal is a villainous mastermind, a brilliantly cunning weasel who constantly schemes in such at a way that the reader is both disappointed by how his actions affect other people and utterly charmed by his quick-thinking selfishness. The Serbian Communist leader is a sad figure, travelling home to almost certain death after half a decade in hiding. The journalist is wily, dedicated to her story but distracted by the clear strains in her relationship. The currant magnate is also a strong character – flattered by the non-avaricious attentions of the chorus girl but still unable to stop bragging about how much money he has. Greene, writing in the early 1930s, also gives an interesting perspective on the anti-Semitism that was rising in Europe at the time. There are several comments about it being a mode of thought of the past. Heavy – and dark – dramatic irony for anyone reading it after the Holocaust. Stamboul Train, though, is ultimately quite light. It’s great fun, it’s brilliantly exciting – people race trains in cars, there are shoot-outs, tense border crossings, interrogations, scamming, seducing, faking, performing, lying, and all of this happening with the backdrop of a journey through Europe. 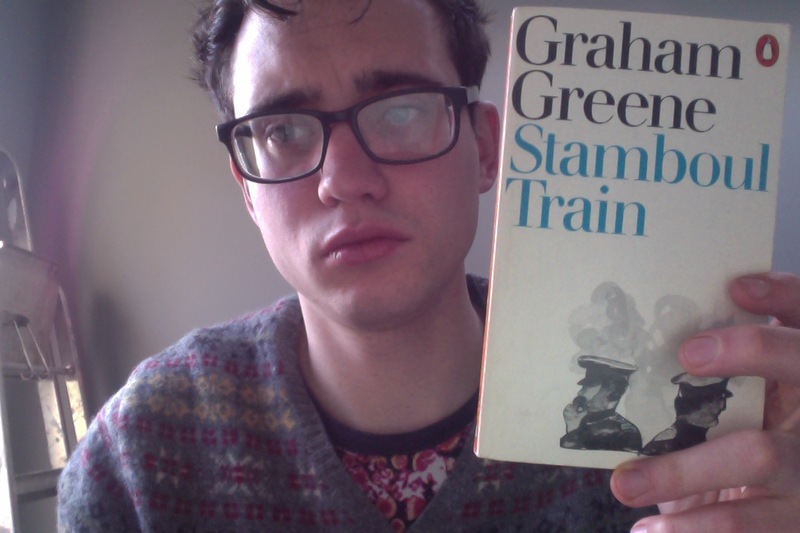 Greene evokes the glamour of first class travel, but also the dirt of cheap trains. In one particularly significant scene, the Communist walks to the back of the train to the third class carriage, thinking that it is perhaps more appropriate for a man of his convictions to travel there. He likes the sense of boisterousness that exists, people travelling without compartments and sharing food and drink and conversation and music, but when he encounters the smell of the toilet he has to leave. He is not the man-of-the-people he would like himself to be. And this is, I suppose, Graham Greene’s skill and importance. Even within a frothy and blisteringly exciting novel of fun, he still manages to slip in a few scenes of epiphany and deeply revealing personal action. Even in a book which intends to cause rapturous smiles rather than deep thought, Greene weaves in this wise understanding of the human psyche.